Studio info: THINKFilm, 125 mins. 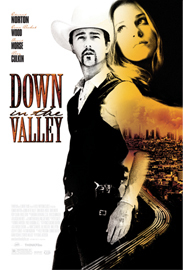 Down in the Valley begins as a promising subversion of the Western genre but swiftly degenerates into an overlong, disoriented conceit that never manages to resolve its ambivalence toward its central character. Harlan Carruthers (Edward Norton) is pumping gas in L.A. when he meets typically disaffected teenager Tobe (Evan Rachel Wood) and her friends, who find his cowboy hat too hilarious not to ridicule. “Are you for real?” they ask when he sidles up to their car. “I think so,” he drawls, an answer disarming enough to start a swift, intense romance with Tobe. It turns out Harlan is not in a position to judge his own reality, and in strict and literal adherence to the logic of Chekhov’s gun, a pistol hanging on the wall in act one goes off in act three. A warped Shane-type, Harlan is an outsider who gets the girl, emboldens her timid younger brother (Rory Culkin) and runs afoul of the local authority figure (David Morse, misused), who’s the kids’ single father. The film’s most impressive insight is that these forms of so-called empowerment are self-flattering manipulations on Harlan’s part, a dramatic dynamic perfectly executed by Norton’s patented mixture of “aw shucks” innocence and thinly disguised menace. But as the film drags on, it becomes increasingly difficult to tell whether Down in the Valley is supposed to be an indictment of the values embodied by the classic Western hero or a character study of someone whose origins and motivations are too vague to command much interest in the first place.